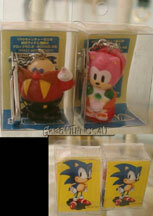 Japan has loads of Sonic the hedgehog Keychains! 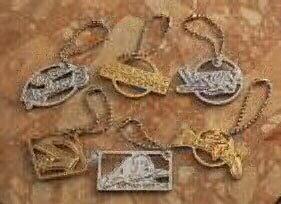 They really went all-out with producing so many different types and styles of chains. No character seems to be left out in the amazing selection. Some of the photos are not that large, but that is the original quality. You do not often see many of these keychains available for sale. 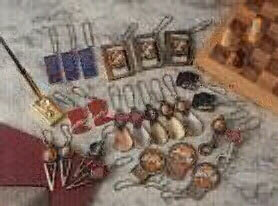 A selection of 10 keyhains and 2 small items. Sonic, Tails, Pecky Penguin, and some pale thing, possibly the seal or the bunny. Look at running Eggman, isn't he funny! An even larger selection of keychains! This time there are 25. The blue ones have Sonic shillouets, the loop ones each have a character face image, there are 2 clipping ones to the right, and an assortment of others you can't really tell what is going on. Too bad the quality is not better... This is a rather old photo. 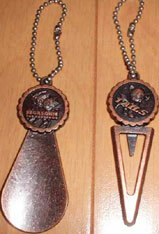 Two selections of Figural Keychains. The set of 4 is pre-Knuckles. The chibi-figure set is so funny with mini-waving Eggman. And they include Amy both times in her old Sonic CD outfit. With these chains, no matter who you are a fan of, you can find the one you want. 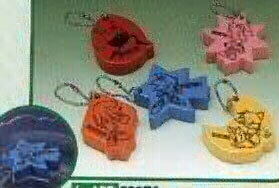 Flotation keyrings. These are tough foams coated in rubbery soft plastic. They are very floaty, and will even float a heavy set of keys. (They are also reminiscent of Lucky Charms Marshmallows) This type of key chain is often given away by Yacht-Brokers. The image in the corner is of the Sonic one being floated in a pool of water. Look at Eggman's one, it is even Egg shaped! Mystery metal Key Chains. These have something to do with Sonic, if you can figure it out. Too bad the quality is so low and small. The photo is from a Sega booklet. Do you have a better one? Send it in to SonicGear to improve the quality. 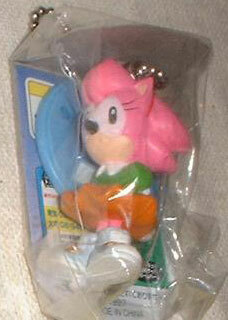 Old-Style Amy keychain. It looks like she snaps onto that blue base, and also comes with a card of some kind. But what is that gray thing above her head? The base looks like it has a name plaque, much like the later Sonic Adventure selection seen below. A Sonic Adventure 1 VMU Strap. This was advertised as a fun way to wear your VMU around so that you could play "Chao Adventure" on it while you were away from your Dreamcast. It could also be used as a key strap or cellphone strap. 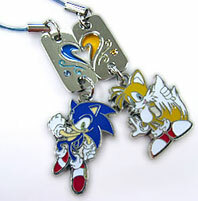 These came in all varieties of the Sonic Adventure characters, but only the Tails and Chao photo was available. This is a very cute Strap. 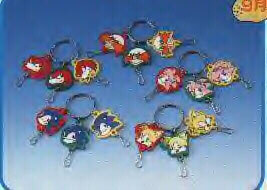 The most well-known and prolific Sonic Keychains must have been this Sonic Adventure 1 set. These quality figural keychains were released at a reasonable price. You can still find them around E-bay to this day, if you look hard enough. With great sculpts like these, it's no wonder collectors want to hang onto them! Here are better photos of some of the above 'chibi' keychains. Mini Amy Rose and Eggman. They're still in the box (inset-box back) and you can see the nice sculpting job they did as well. Amy is holding something Pink, possibly a flower, and Eggman is pointing. The packaging has Japanese words. Photo by GreatThings4U This keychain isn't officially Sonic, but it was a part of a Sonic promotion when the Sega Dreamcast came out. You can sort of see the reddish/orange-ish swirl on it. 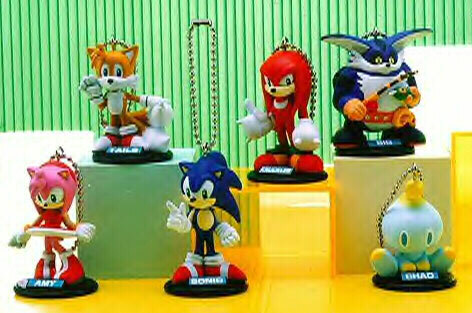 A brilliant set of PVC Sonic & Friends Figural Keychains. Look at their cool and unique poses! Peace-Sign Amy is so fun! And look at dancing Sonic and Tails. This set is fully 3D and seems to have a real nice qualtiy to them. These are fairly recent, so they should still be easy enough to pick up. These were actually GIVEN-AWAY with Coca-Cola in Japan. How cool of a promo is that? These are old-style Amy Rose key holders. Similar to a key-chain, but not quite. First, they're all the same Amy head, just with different colored backgrounds. Each plastic piece is attached to the central ring, and has a loop at the bottom. You can attach keys or charms to this little loop. 5 sets with 3 key-holders on each. These are the type where you clip the key or another ring to the bottom, rather then on a ring. Here you can see each of the characters that appeared, as this is a Sega booklet photo. These were likely to have been released right after Sonic 3 came out in Japan. 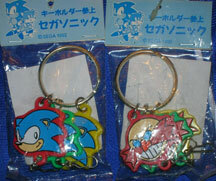 Here's another good close up so that you can get a better look at the Sonic & Eggman key tag sets. All of these work exactly the same and came with a red, green or yellow background, all with the same face on the front. Sonic looks quite decent here, and Eggman looks mad. Photo by Nick M.
Here's a wonderful new item from Japan! This is a "Best Friends Charm". You get one, and then give half to your best friend, just like Sonic & Tails! These may be key chains, or you could use them as charms, or phone charms. They're nice quality looking metal, with enamel for the colors. If you look at the design at the top, it makes a heart shape when you put them together. What a clever set of little charms to collect! These are still being sold in 2009, and they are between 5 and 10 dollars to buy. Photo discovered by: . Which is especially interesting because of it's similarity to the "Sonic Adventure 1 Figurals" above. Surely, this old key chain must of been what inspired the newer set seen on this page, right down to the base with name-plaque. Obviously this is an older style Sonic, but the age isn't known. It's still fully 3D, and well sculpted. A nice addition to your key chain collection! Photo by Rhia. 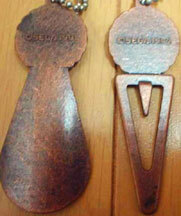 Here are 2 cool copper keychains. They are likely to be actual copper with a patina applied. The tops feature reliefs of jumping Sonic and looking-out Tails. Sonic even has a 'fade' effect which is difficult to do in relief. The Sonic keychain is a shoe horn, and the Tails one is a book mark. Sonic is copyright 1991 but for some reason the Tails one is 1992. There may be other characters available.